Happy Friday the 13th, everyone. I hope everyone is having a great day and staying away from black cats and sidewalk cracks. But in today's awful luck, a $700,000 mansion was set on fire near Dallas, Texas... to prevent it from falling into a lake. 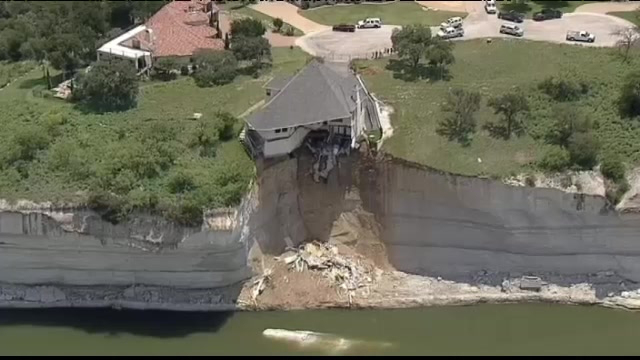 OK, so it might not just be bad luck; the home was built near the edge of a 75-foot cliff on Lake Whitney. If that doesn't seem like tempting fate already, a recent landslide sent half of the cliff tumbling into the lake. Parts of the home have been falling into the lake for weeks now. Officials toyed with how to deal with the teetering house. One — wrapping a giant net around the house to physically pull it backward from the edge of the cliff. This written off by engineers as unfeasible. No joke. Another option was to let the continued landslide eventually take the house into the lake on its own, which was determined to be too expensive to clean up. Eventually, officials settled on an incendiary option: Lighting the house on fire with hay soaked in gasoline. A local NBC affiliate reported that workers were seen bringing in three bales of hay and a gallon of gasoline into the 4,000-sqaure foot home's garage this morning at 10 a.m. The burn started around 11:45 a.m. The homeowners, who moved into the luxury home in January, noticed cracks in the walls shortly after moving in. Think about that next time you see a crack in your wall: Your house could be crumbling into a lake. The owners safely vacated two weeks ago. They said that they were assured that the house was stable when they purchased it. After the fire is out, the owner will be responsible for moving the debris to a safe location. The homeowner is believed to be in Florida attending to family matters. Lucky for them, their good neighbors are there to watch the house go up in flames.